With it’s 32 pages of full color detail, it seems at first this book will take forever to read but I was delighted to find out that there were only one or two sentences per page, making this a wonderful bedtime or quiet time story that helps children remember just how special they really are in God’s eyes, no matter what they look like, or what different abilities they may have. 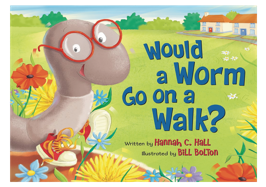 Click the link below to add “Would a Worm go on a Walk?” to your book collection today! *While I was delighted by the whimsical scenes within the pages of “Would a Worm go on a Walk” I do want to take a moment to point out that there is a small section asking if a ladybug would wear lipstick, to which the reply is “No, some ladybugs are males.” it felt a bit as if the author was pushing gender rules, which we don’t strongly enforce in our home. Our Full List Of Recipes Is Just A Pin Away!